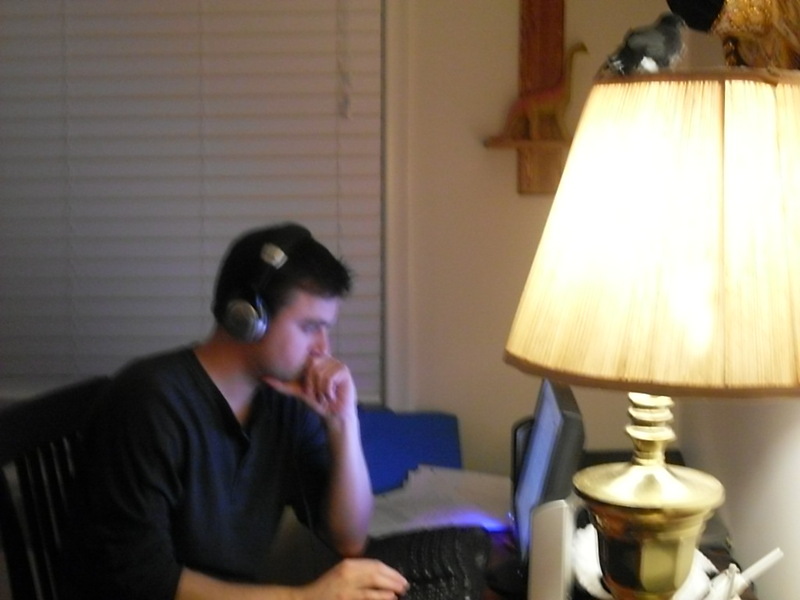 Right now, Nick is rustling papers at the big computer, and he’s got his headphones on and he’s working on his novel. He’s a very good writer, and much better than I am at staying on task. I’m supposed to be writing as well, because the deal was that we were both going to write bestselling novels at the same time so that we could be awesome together, and then we’d get rich and quit our jobs and do whatever we wanted. The reality is that I have no focus and my cat is enticing me with her cuteness and my creativity levels have plunged to a new low. At this point, I shall be an editor forever, which will not help me get rich OR famous – practically no one else cares about punctuation or using the right homonyms. At least I’ll eat well. Sometimes, distraction is all kinds of delicious. In a large pan over medium-high heat, stir together sesame oil, onions, and garlic. Cook together until garlic has begun to brown. About two minutes. Stir in chopped black beans, chili paste or flakes, soy sauce, black pepper, and fish sauce, and mix until well combined. Also, I should mention, all of these ingredients should be available in your local supermarket, in the Asian foods section. You can substitute black bean sauce for the beans in a pinch, but cut down the soy sauce if you do. Add beans, tossing to coat in liquid. Stir-fry for three to five minutes, or until beans are heated through, with skins that look like they’re beginning to wrinkle. Serve hot. 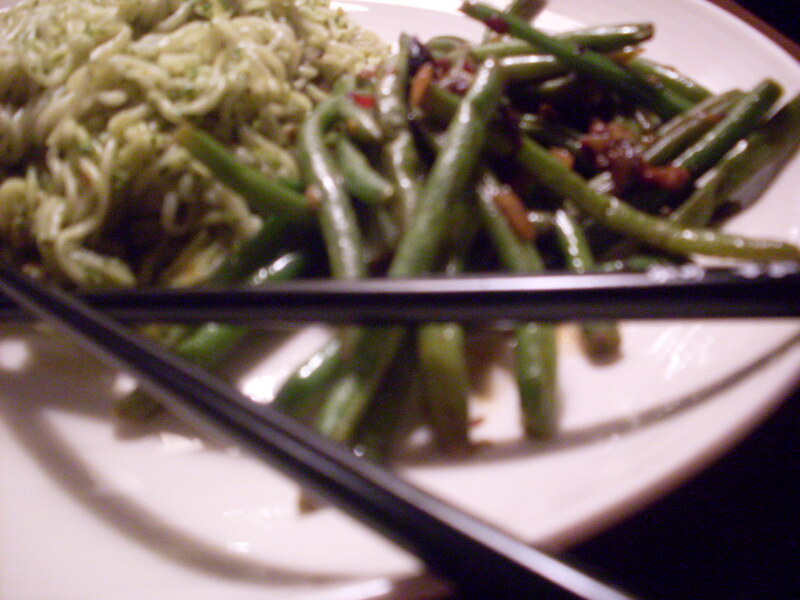 These are like the Szechuan green beans you get at dim sum, and we eat them all summer long. I had some of last year’s beans still in my freezer, and I’ve missed them. They’re a great part of one of those dinners where you don’t feel like cooking, when you want everything to come together in under twenty minutes. Tomorrow, I’ll tell you about the other half of tonight’s meal, which came together in under ten minutes, even though I didn’t end up doing anything productive with the saved time. Next > Thai basil is the greatest invention since regular basil. Green beans are my partner’s favorite veg, so he’ll appreciate this one. 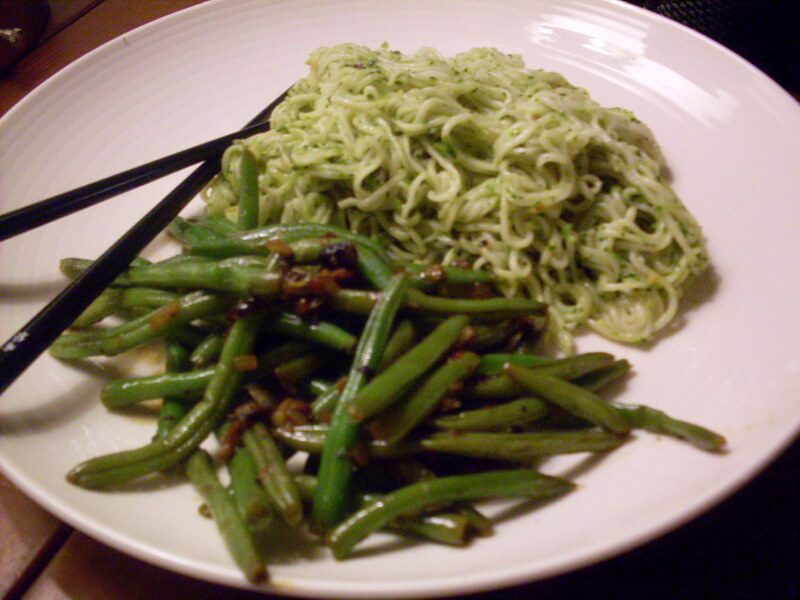 And I am eager to hear about the pretty pale green noodles. So my question isn’t food related. I noticed your cat has a comfy looking bed. What disturbs me about it is that it’s got a big-cat pattern on it. That’s like me sleeping under human-skin lookin’ blankies, no? 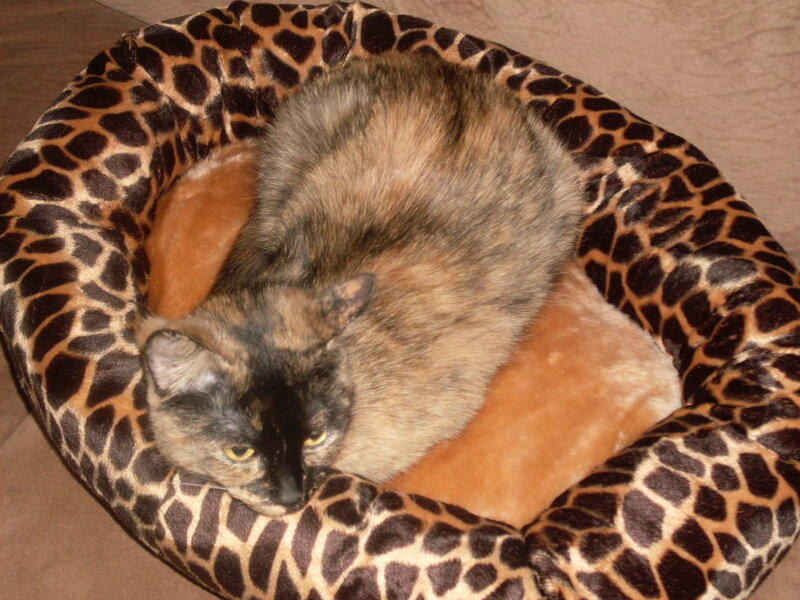 No, it’s okay – the bed is giraffe-print, which is not apparent in the photo. I promise. Now you’ve got me imagining skin tarps. Eesh.